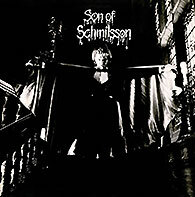 Harry Nilsson’s Son of Schmilsson. Ooh, scary good! 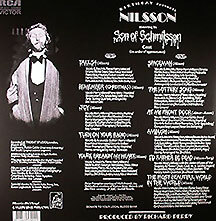 Without question, Harry Nilsson’s Son of Schmilsson was the right album for the right time. When it was released in 1972, I was 17 and had my sights set on college. I was especially open to new ideas. Enter into my record collection this completely unhinged set of songs that perfectly summed up the artist’s newfound penchant for baiting the listener with a love song and, in the next heartbeat, pulling out the rug from under you and dialing up an in-your-face rocker preceded by a healthy belch. Despite all that, this was a pretty typical Nilsson album. He hadn’t abandoned his gifts for melody or whimsy; he just dressed them in funkier clothes. For every lowbrow joke on the record—the aforementioned belch preceding the wild and wooly rock ‘n’ roll oldie, “At My Front Door,” there was a straight-ahead, old-fashioned, sweet little number like “The Lottery Song,” in which a couple flirts with winning the big prize amidst hopes of growing its value in Las Vegas. Well, sort of sweet, anyway. And there was “Turn On Your Radio,” a beautifully-arranged, pretty song about hope and being at peace with the one you love, even if that person is far away. There were other, more sanguine numbers that threatened to eclipse the less dainty ones. “Remember (Christmas)” was one, a beautiful, wistful look back at a life lived to the fullest. There were a few, emotionally-invested rockers, too: the bluesy, horn-infused “Spaceman”; the equally bluesy, late-night jazz club vibe of “Ambush”; and “Take 54,” a take-the-chick-and-run song of the highest order. And—oh yeah, that was about it. That leaves the jokes, and they were plentiful. Low and even lower still, but plentiful. 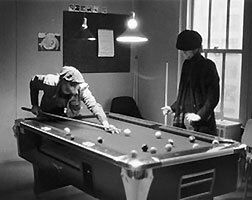 And melodic, too, wonderful compositions that showed that Nilsson hadn’t abandoned the things that got him here, wherever that was. There was the faux country song “Joy,” delivered in a mock country crooner tone and actually—somewhat suspiciously, some might say—released as a country single under the pseudonym Buck Earl by RCA. And let’s not forget the jokey-on-the-surface “I’d Rather Be Dead,” sung with gusto by Harry and a group of senior citizens. Believe me, even at 17, the sentiment was not lost on me. Who wants to wet their bed? Of course, the song on everybody’s lips was the infamous “You’re Breaking My Heart,” which proudly flaunted the f-word and sent parents around the world running towards their kids’ stereos with hammers. Such language! The backside of Son of Schmilsson! But Harry’s not fooling anyone. The punch line is right around the corner. “So when you get older/And over your shoulder/You look back to see if it’s real/Tell her she’s beautiful/Roll the world over,” he sings, and, bingo, the payoff! : “And give her a kiss/And a feel,” as the orchestra and Hollywood blockbuster chorus swell behind him. A beautiful setup followed by a tiny, smutty joke. Really, a song about a girl? Who knows. Pure Harry. Surely, Son of Schmilsson was not the work of the man who made Pandemonium Shadow Show. Or Harry, even. This was the work of an artist bent on market self-destruction, a man who began making the recorded left turn his raison d’etre. But it’s the Harry album that I always come back to because it synthesizes the various colors of the artist’s writing and performing gifts. The songs make you laugh, cry, laugh again, and shut the door and put a towel at the bottom to keep your parents from hearing the smutty jokes. Son of Schmilsson is the most beautiful album in the world, to put it mildly, and an astounding 42 years after its initial release, it remains my favorite Nilsson platter. Plus it’s got Richie Snare, George Harrysong, Nicky Hopkins, Peter Frampton and Klaus Voorman making the songs come alive, and it’s got a deep, resonating belch. Who could ask for anything more?